Referral must open a demat account with minimum of Rs.10,000 fund margin and must maintain the average balance for min 1 month from the date of account opening. 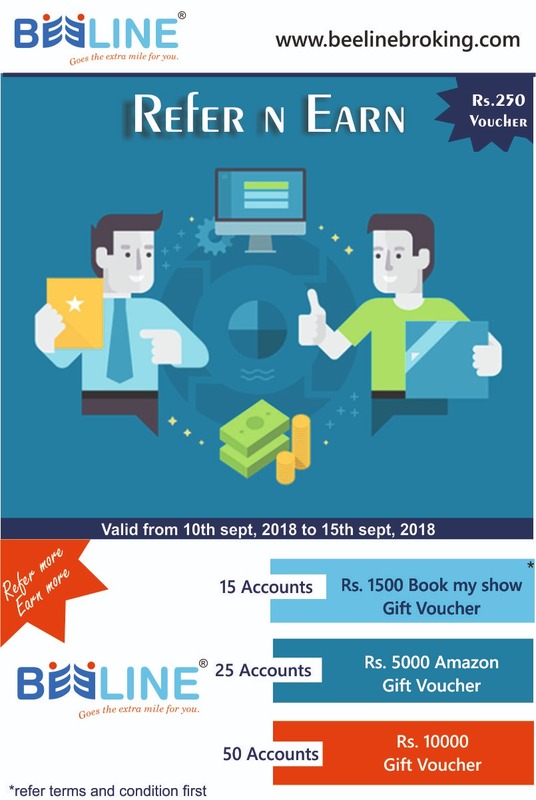 Referrer will get gift voucher worth Rs.250 as reward for each account open & will get Life Time (10 % + 5%) referral brokerage. This offer is valid for registration received between 10th sep, 2018 to 15th sep, 2018 & KYC form received on or before 24th sep,2018 with all necessary required documents. Referrer must registered referral through Back office app of BBL. This scheme is not applicable to Sub broker/ Sub broker’s family code, Employee & Employee’s family code. Referee should not be immediate family member of the referrer or having same address. Margin money must be received at the time of account opening & cheque must be cleared on or before 24th sep,2018. In case of any dispute, the decision of Beeline Broking Ltd. (BBL) management will be final and binding. BBL reserves the rights to withdraw or modify this scheme without prior notice. This offer is for limited period & can’t be clubbed with any other offer. All communications regarding referral program will be sent on the client’s registered email id or mobile number. If required, please update same to avoid any difficulty. Call on 9033006912 for Details.